The convenient and splendid machine in your kitchen that you use to wash dishes and stainless-steel pots and pans needs to be cleaned too. Never put non-stick cookware into a dishwasher. Whether your dishwasher is stainless-steel, or plastic inside does not matter for how to clean your dishwasher inside. If you wash dishes daily, soap scum and food particles will accumulate in dishwashers. Mold and mildew can accumulate from the humidity. Most food scraps will drain and go into the garbage disposal side of your sink. A dishwasher is a breeding place for germs and bacteria to reduce the effectiveness of your dishwasher. Here’s how to clean your dishwasher in 3 easy steps using no tools. This should be done every six-months or more depending on how often you run your dishwasher. If you thoroughly clean your dishes like I do before loading into the machine, you shouldn’t have much debris at the bottom. 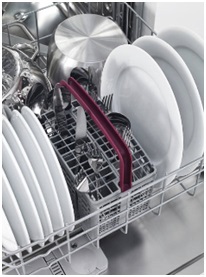 Take out the bottom dish rack and examine the dishwasher drain removing any food caught there. Sometimes I find soda straws and plastic spoons on the bottom. This will improve drainage, increase cleaning performance, and prevent damage to the dishwasher. Be sure your dishwasher is empty. Put the bottom rack back in to clean it. Put a cup of clear distilled vinegar in a glass bowl or jar on the top rack. Run the dishwasher through a complete very hot water cycle and turn the drying button to off. 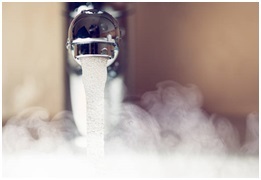 Always run your sink water until it is hot since the hot water heater and pipes are usually far away and the dishwasher will start with cool water. Do that when you start the machine to wash its load of dishes as well. 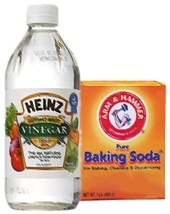 The vinegar action will wash away grease and residue stuck on removing the musky smells you might have. Rinse after that cycle has finished by sprinkling one cup of baking soda along the bottom. Make sure your sink faucet water is hot again and complete a hot water cycle with a rinse cycle. Open the door when finished and pull out the racks to allow to air dry. Your dishwasher will smell fresh, look bright, and the stains should be gone. Use detergent with water or spray window cleaner on a clean cloth for the outside and a toothbrush if necessary on the rubber seals. Use a cotton swab dunked in vinegar to clean around knobs and push buttons. How to clean your dishwasher video. Tip: Never ever leave your house when the dishwasher is running! My friend did, went on vacation coming back a week later to a flooded basement and upper floors! When you keep up with cleaning your dishwasher frequently, the task will be easier to do, and your dishwasher will look and smell fresh and run more efficiently too. Your dishes, glasses, pots, skillets, and pans will smell great and be sparkling clean after you clean your appliance.